(I’m late noticing this one but…) recent BBC Two police thriller Line of Duty (starring Lennie James – Jericho, The Walking Dead) filmed several sequences in the old Fire Station, on Lancaster Circus in the city-centre of Birmingham – a filming location used extensively in the second episode of series two of Survivors. In Survivors, the old Fire Station provides the base where the recuperating Greg and Najid rest-up while the rest of the family hunt for Abby (and where the pair come under siege from the group determined to take back the supplies which the expelled Tom stole from them). In Line of Duty the abandoned facility becomes the setting for a series of violent confrontations between detective Tony Gates (James), undercover police investigator Steve Arnott and the vicious gang with which Gates has become ensnared. 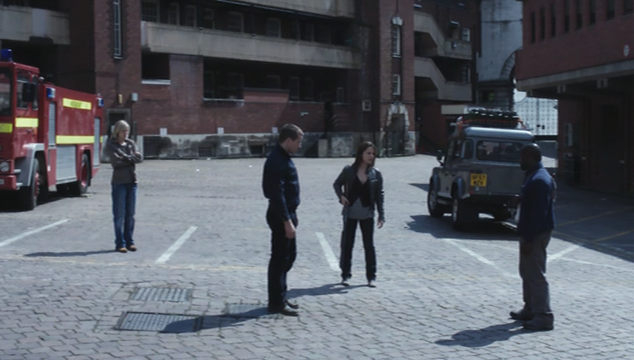 Brief extracts of Line of Duty episode four (‘Cover Blow’) and episode five (‘Divided Loyalties’), featuring the old Fire Station location, can be viewed online (in the UK). A gallery of photos of the disused and derelict building is available on the ClioSport forum. This entry was posted on September 22, 2012 at 11:48 am	and is filed under Filming locations, Survivors. You can follow any responses to this entry through the RSS 2.0 feed. You can leave a response, or trackback from your own site. @Ryan yes agreed but highly unlikely given that is now five years or more since the end of the second season. Another example of the BBC’s infinite wisdom when it comes to cancelling a show before it’s reached its natural end. They did most famously with 1980’s scifi drama Tripods and then again just recently with Ripper Street (although that has been picked up by Amazon Prime). OMG I just crushed the first two seasons, please brings this show back! !